Sixth Prize! Donated by Pink Snow Flakes! And we thought this raffle couldn't get any better! 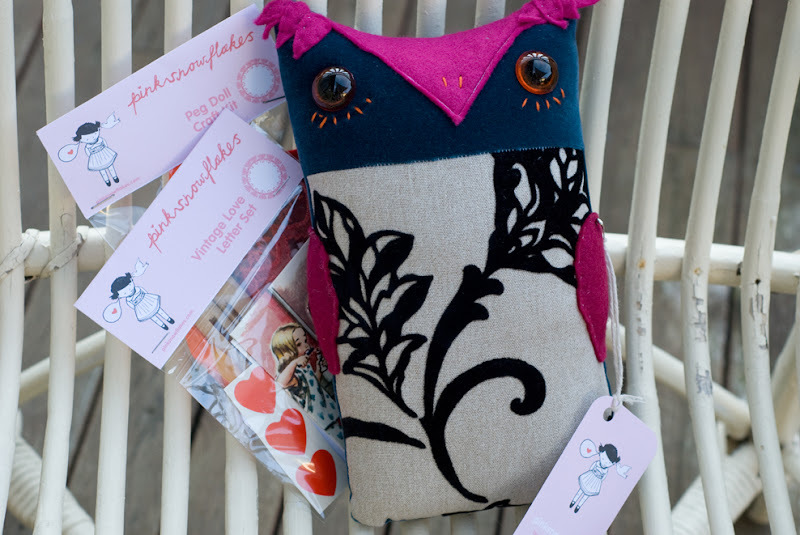 The lovely Laura Mah, seamstress behind the absolutely gorgeous Pink Snow Flakes handmade toys, has donated the very beautiful and very soft Velvet Verity the Owl to be our sixth prize at the Project Patchwork raffle night! Wow! Here is the final patch!! 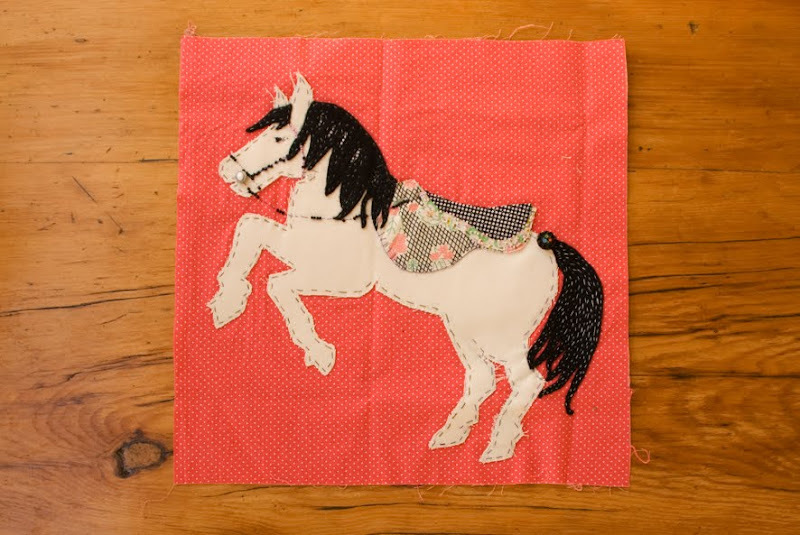 Sewn by the very talented and lovely Nella Themelios, coordinating curator at Craft Victoria. Such bright and pretty colours, in such cool geometric shapes. The hot pink piece is even made out of lycra!! Nellas patch is the sprinkles on the cake/our quilt. Nella is such a busy girl, curating exhibiton after exhibition at CV, yet still managing to find time to curate shows in her personal time. Insert Coin Here was one show Nella and Kim Brockett curated earlier this year, which was a cute travelling exhibition held in vending machines filled with many talented arstist capsules. You have to read more about it here. Another recent exhibition Nella co-curated was The Sound Project. An exhibition series of performances of experimental instruments which was held at fortyfivedownstairs in July. Pretty amazing looking instruments! I can only imagine what they may have sounded like... super sonic! 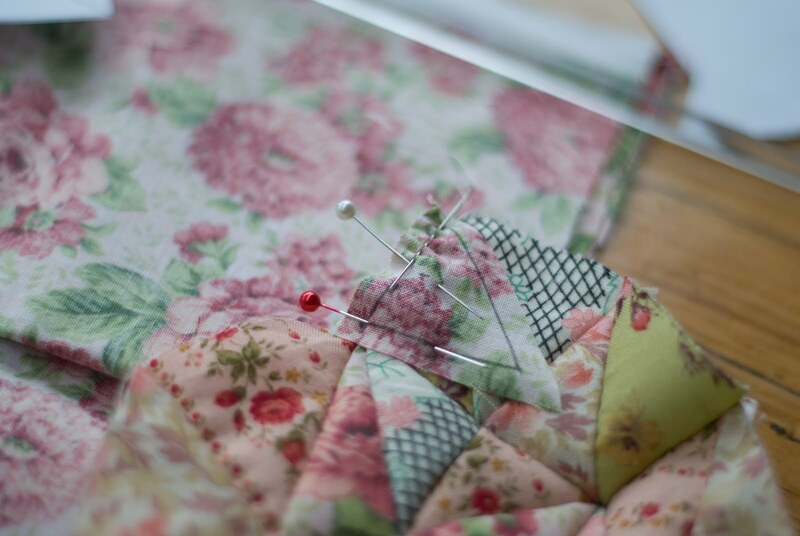 Nella is one talented young lady and I feel so lucky to have her sewing a patch for our quilt!! 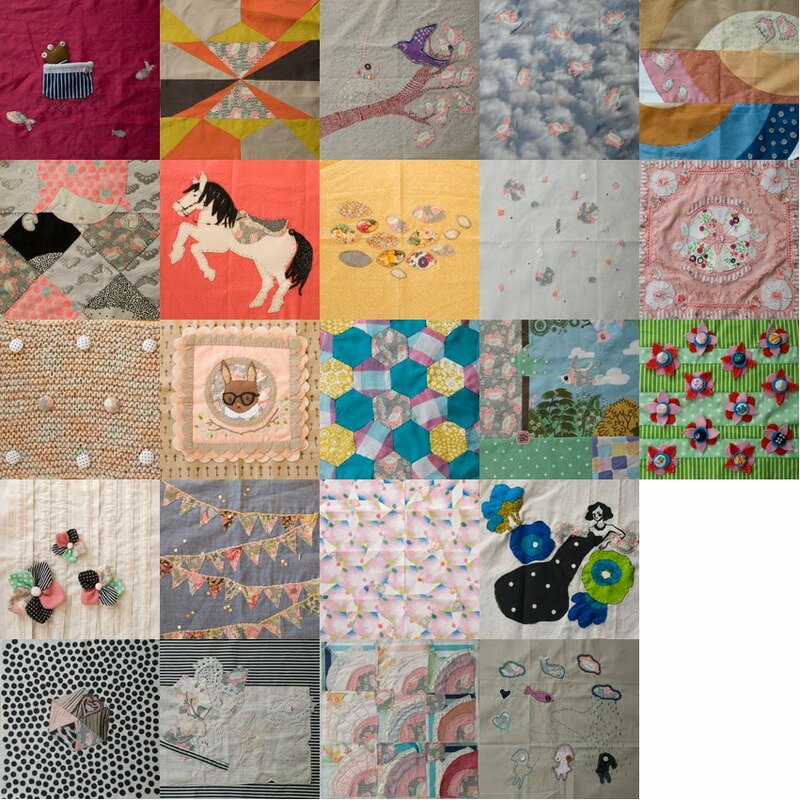 Scroll down to see the complete quilt mock-up! Now, this may or may not be the layout the quilt will finally be in. 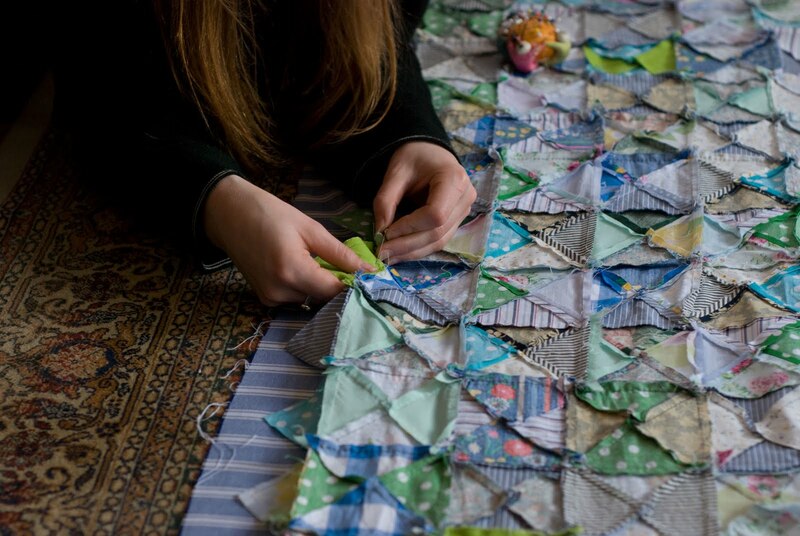 Alice Jones and I have been working really hard this week sewing together the Crafty Ladies & Gents quilt. 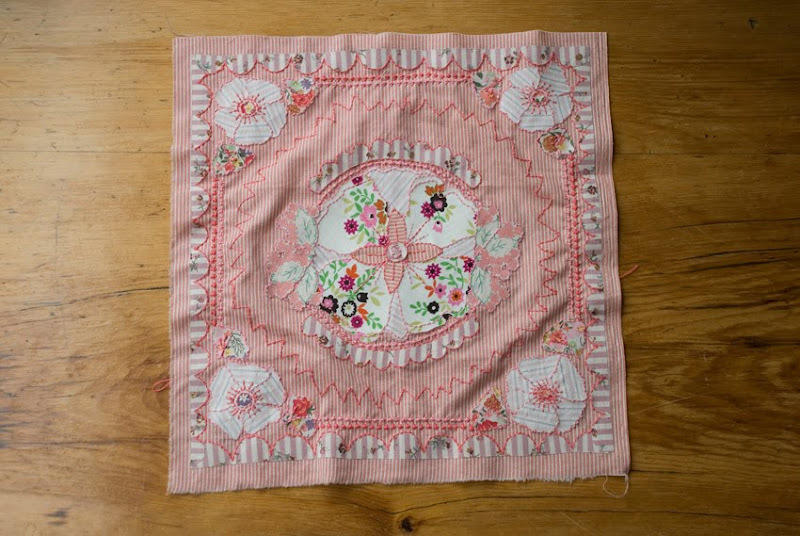 We have added little linen boarders around each patch and chosen a really lovely striped fabric for the back to tie it all together. Photos of our progress will be up tomorrow! I have been working hard on my patch this weekend. Finally! So, here it is! 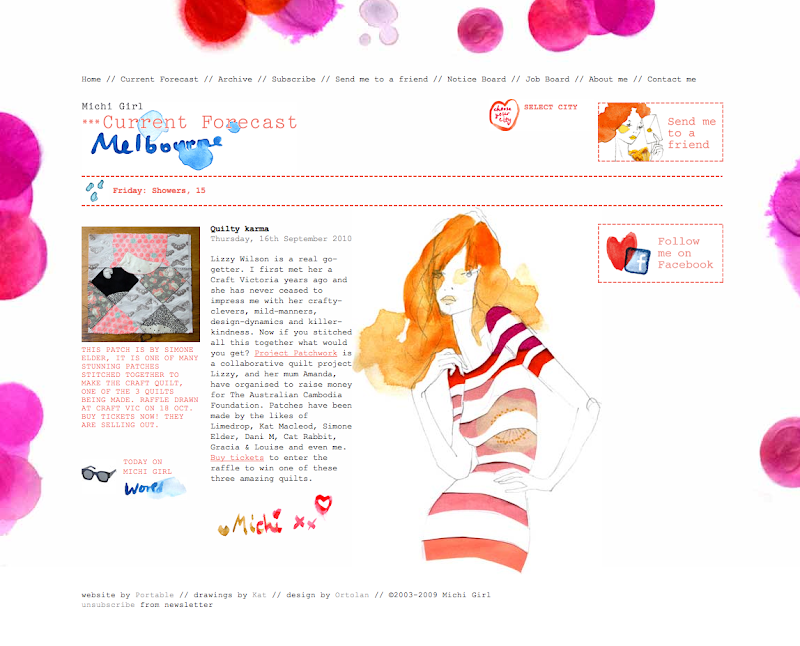 Yesterday the amazingly gorgeous Michi Girl posted a lovely little story about us! You can read it here. Thanks Michi! I have once again been inundated with people buying whole books of tickets! Thanks guys! We have also had a few of our first international ticket sales! wowzers!! How exciting! We have so far raised about $1500! Oh my goodness, thank-you everyone who is involved whether you are a sewer, a supporter or a sponsor. We have still got 4 weeks to go and you can buy tickets right up to the second before we announce the winners on Monday 18th Oct at 6.30pm. 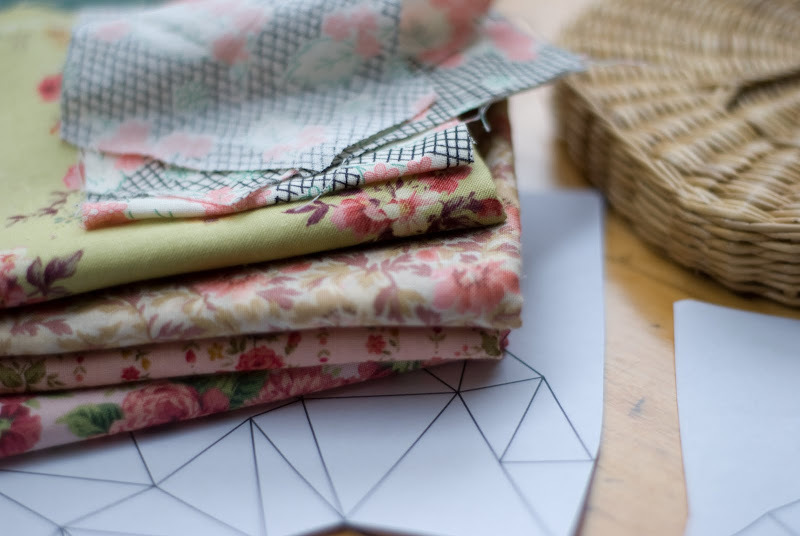 Here are four gorgeous new patches, two of which you have never seen before and the other two you may have noticed in the mock up of The Crafty Ladies & Gents Quilt image I posted last week. I have updated the mock up to add Alice & Carmel's absolutely stunning pieces of work. Two more to go... and my I mention one of which is mine. Oops. 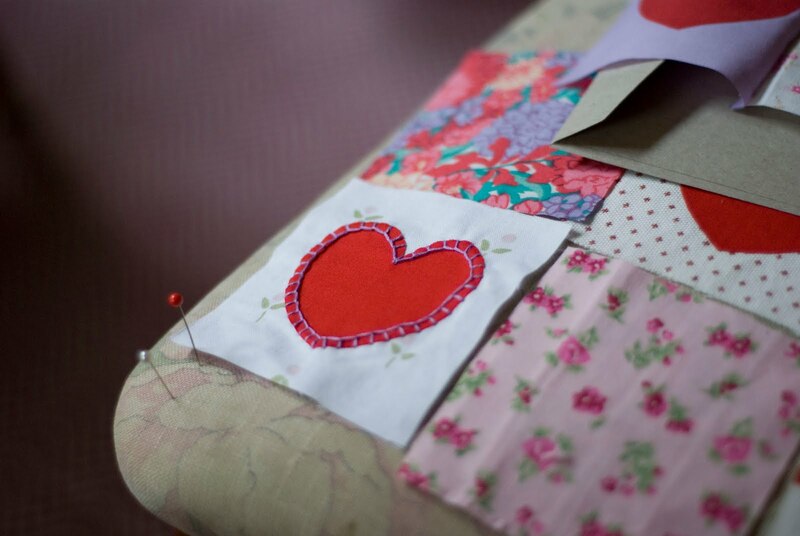 I promise to have a real image of the whole Crafty Ladies & Gents Quilt up on the blog by Friday next week. Promise! So you better be back! p.s. Thank-you to the lovely Little Bean for her gorgeous post about PP! You may view it here. To The Bloggers! We Love You! 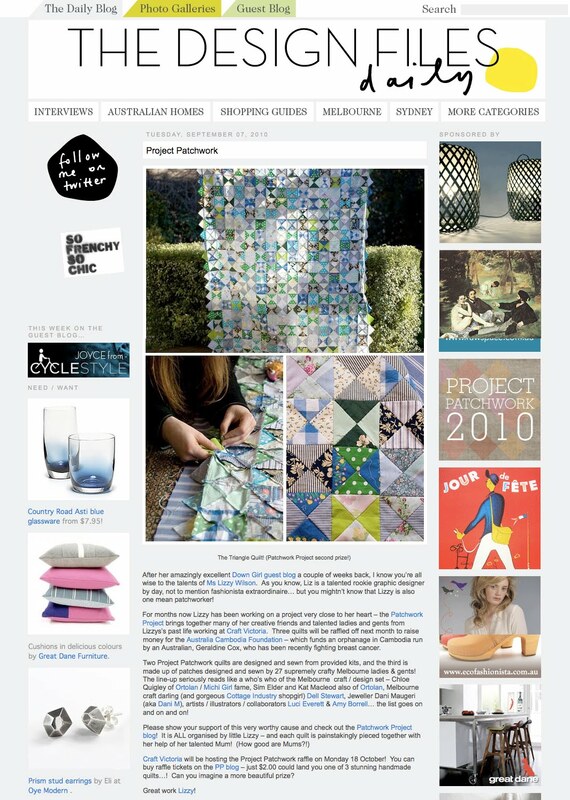 Did you see Project Patchwork featured on The Design Files yesterday? You can read it here. Lucy was so kind and did a little surprise post about us which I discovered when I got to work as I am an obsessive TDF lover. I became suspicion on my drive in as I was being inundated with little email beeps on my phone. I could hear it beeping in my bag every few minutes which I was later to discover was from all the raffle ticket payment notifications going into the PP paypal account! SO many of you bought tickets yesterday that firstly I have to do a big second round of tickets, as we have totally run out. Thank-you SO much!! And, secondly I am being audited by PayPal as the influx of money was so great! Thank-you everyone for your support! wow! This is one super raffle! I'd also like to thank Evie (so much!) 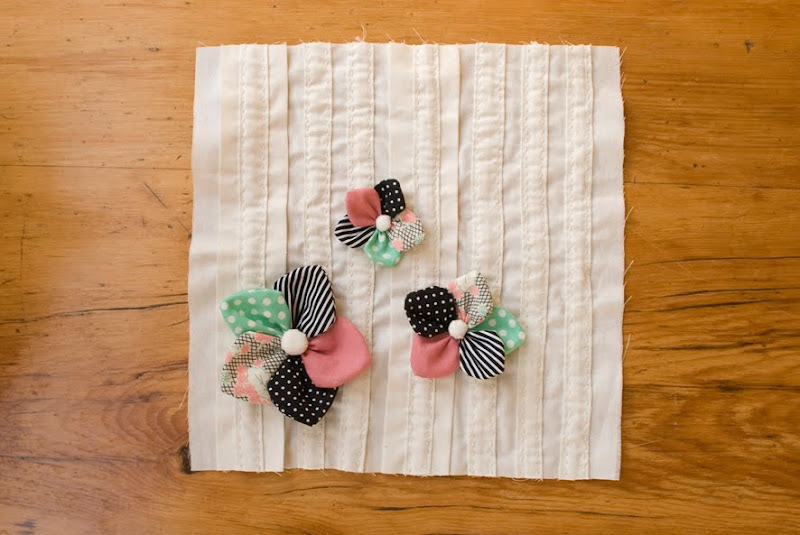 from Handmade Romance for her lovely blog about us! You can read it here. Gemma from Not Today has been super productive tweeting about us, writing about us on their facebook and don't forget donating some Not Today Milk Crate Cushions as the PP fifth prize! Yay! 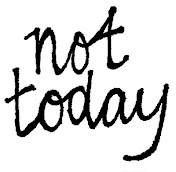 Oh and if you haven't already, go check out the Not Today new website here! Also, Justine from Upon a Fold has been lovely and tweeted about us too! Thank-you! Here it is! 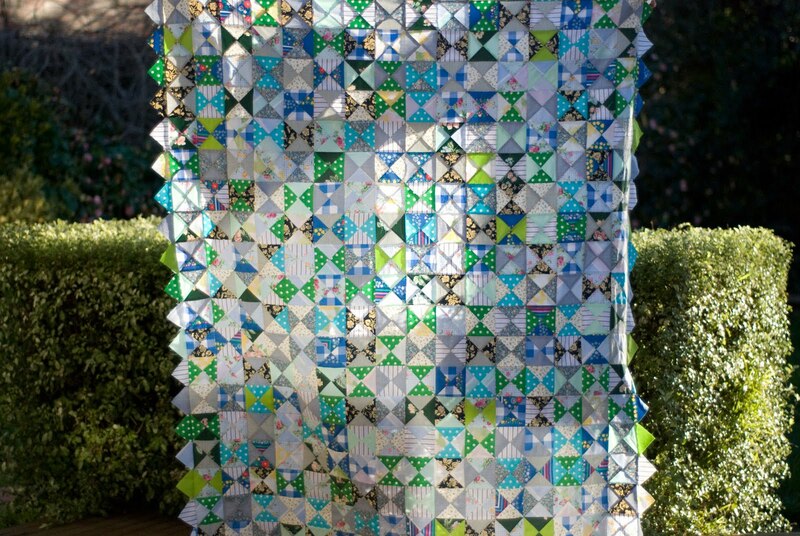 The Crafty Ladies & Gents Quilt! This is a mock up of the patches so far. As you can see I am missing four patches in this image. Two of them I am yet to photograph, I promise I will do that this weekend so you will be able to see them on Monday, and the two others I am waiting to receive. I am so excited that we are almost there! 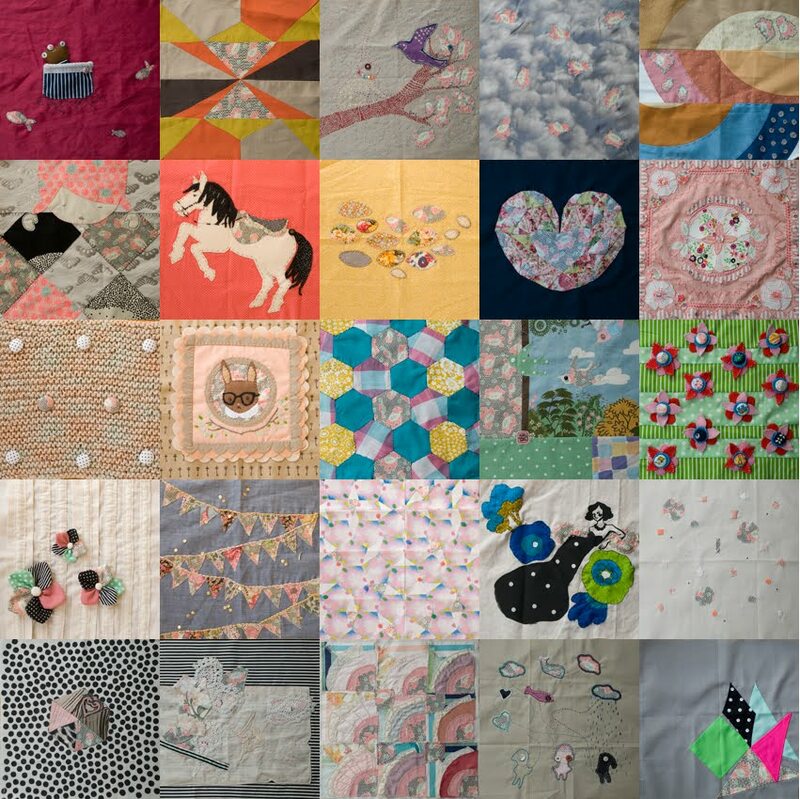 Such beautiful work by many amazing talents all in one quilt! This isn't the official layout, I just quickly put it together today, but my plan is to do something similar in terms of the colours. 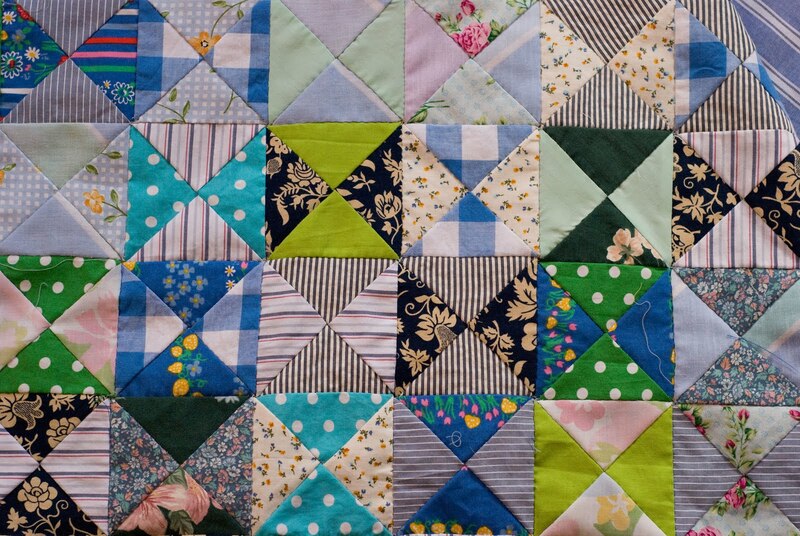 I think that creating a slight rainbow effect across the quilt may help to tie all of the patches together nicely. As they are so different, it is a bit of a challenge to make them look unified. I am also planning to put a little linen boarder in between the patches with each sewers name embroyded in gold thread underneith their own masterpiece. Double click on the image to make it bigger in a new window so you can see a little more of the detail. I'd love to know your thoughts! Any ideas/inspiration/advice! 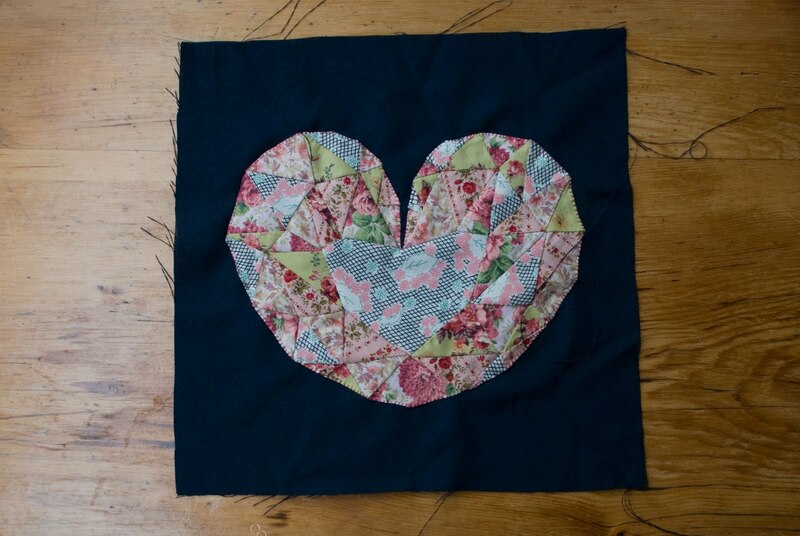 You've all been waiting so desperately to see the heart quilt progress I know, so... here it is! How lovely is the scalloped edge! Mum had done such a beautiful job putting it all together. She just finished tacking the front, batting and back together this weekend, all ready to quilt together. I will post up photos of her beautiful technique as soon as she starts. 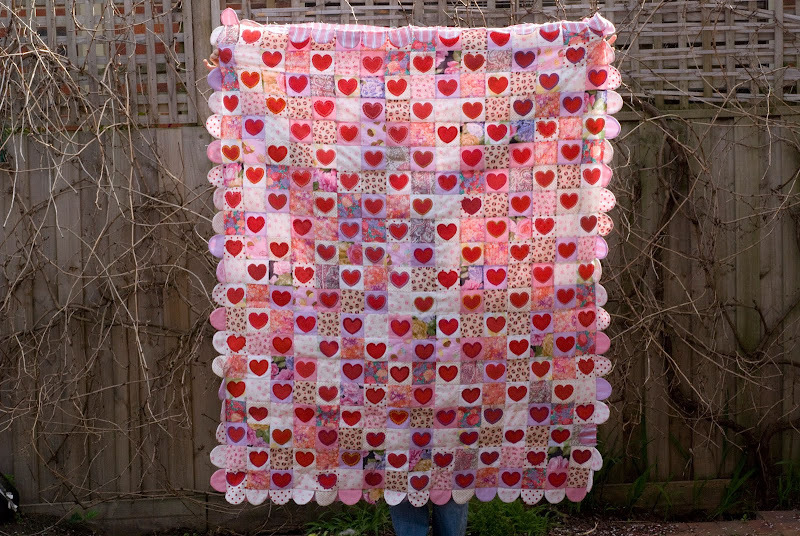 You cant see from the first photo above the detail to the quilt but each heart has been so very carefully blanket stitched around. 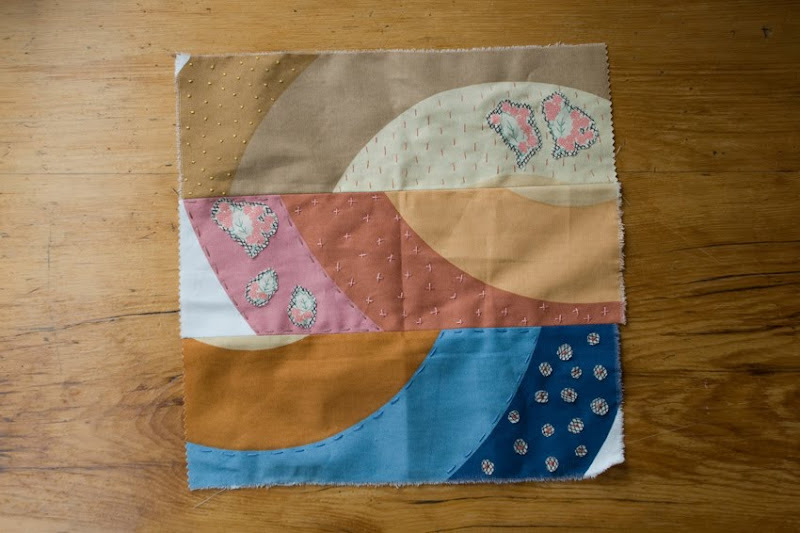 Thanks to all the gorgeous people who sewed a patch together, everyone has done such a beautiful job! Remember this photo above, well since then I have been super busy sewing the back on (see photo below). Once that's done I'll tack the batting on, turn it right way in and quilt little diamond shapes into the pattern. 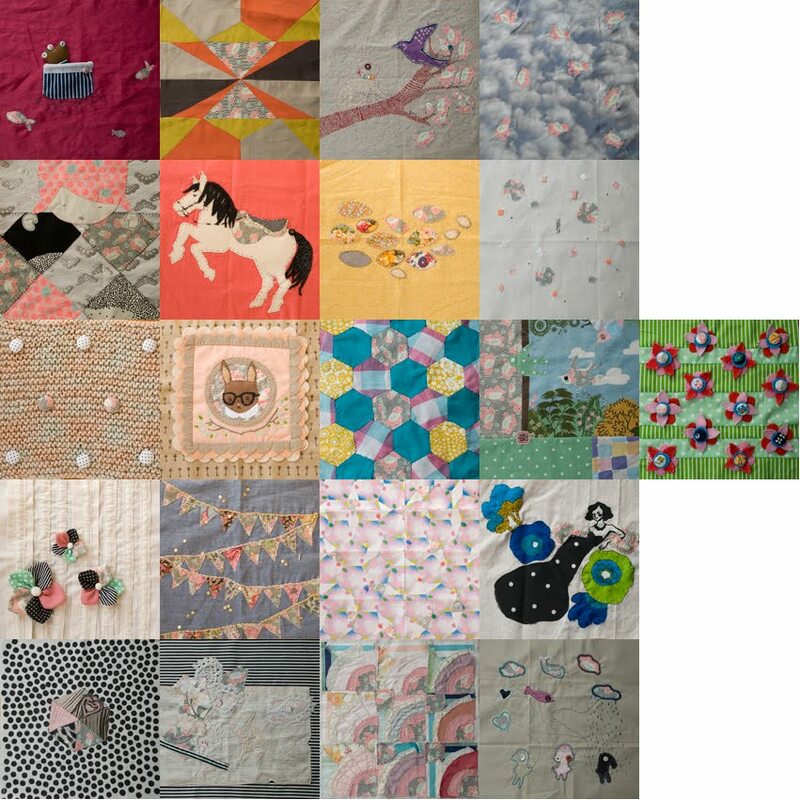 Thank-you also to The Triangle Quilt sewers, everyone has lovely little stitches and has put them together so beautifully. 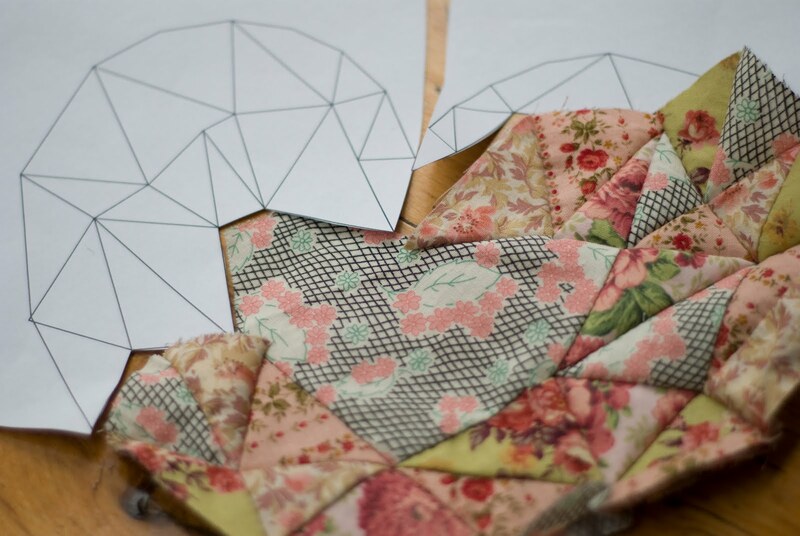 Here is a close up of The Triangle Quilt pattern. Can you see the diamond shape I am going to quilt in? I'll give you one clue, its made up of eight triangles. 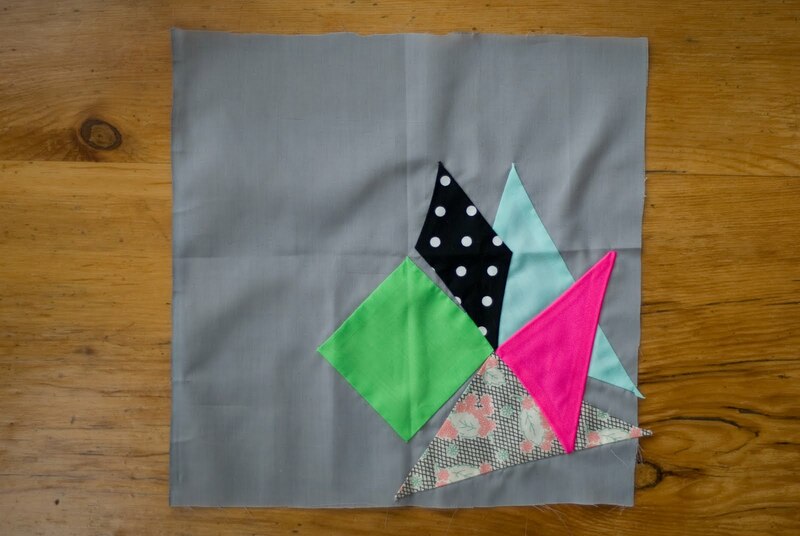 I'm looking forward to getting up to that part, I think it will be fun making little diamond shapes appear. Stay tuned for update on The Crafty Ladies & Gent's Quilt in tomorrows post.